My daughter, Grand Prix Dressage Rider and Trainer, Jennifer Truett, and I have co-written a book on finding your "Unicorn" (the perfect horse, as dressage trainers call them) for any level dressage, hunter, jumper or event rider and caring for them. Watch for it to be published in 2019 by Xenophon Press! "Flights of Fiction," an anthology of stories set in the Miami Valley, Ohio, which includes a suspense/horror story by Lynda Sappington. 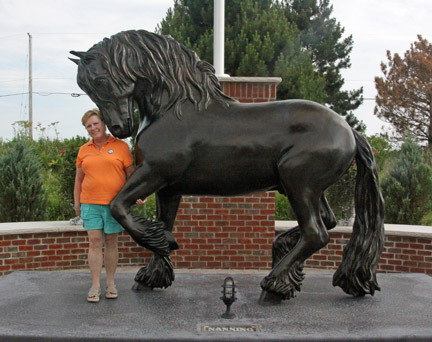 Lynda Sappington with her life-size sculpture, "Nanning 374: Spirit of the Friesian"
Lynda Sappington is well-known both as a sculptor and a writer. You can see her sculptures at www.TheSculptedHorse.com. She does commissioned portraits, trophies, memorial pieces and various other art projects. Her artwork is collected world-wide and she has made many prestigious horse show trophies, year-end awards and racing trophies. Sappington is also known as a writer, with her how-to book on sculpting, Sculpting 101: A Primer for the Self-taught Artist, now in its second edition, She and her daughter, Grand Prix dressage rider and trainer, Jennifer Truett, have co-written a book on finding your "Unicorn" (what trainers call the "perfect horse") and caring for them, which will be published in 2019 by Xenophon Press! In 2012, she had a horror story accepted to an anthology that was published in 2013. She has also written numerous articles for magazines over the years, and was the publisher and the sculpting columnist for ARTVoices, an online magazine now out of circulation. She is also the Marketing Director and Webmistress for Dancing Horse Farm, Jennifer Truett's training facility. Unicorn! * How to Find and Maintain Your Perfect Horse! "Unicorn! * How to Find and Maintain Your Perfect Horse!" (working title)" is co-authored by Lynda Sappington and her daughter, Grand Prix dressage rider and trainer, Jen Truett, owner (with her husband, Lenny) of Dancing Horse Farm, Lebanon, Ohio. Lynda and Jen are both life-long horse owners. Combining Jen's highly educated expertise with Lynda's life experience and research, this book is a guide for those who are thinking of buying a horse, so they know what's involved; for those who have recently purchased their first horse, so they have a guidebook that explains everything from vaccines to illnesses to saddles to roadside assistance for those hauling horses to what to look for in trailer tires to pretty much everything else involved in taking care of horses; and for those who are moving up the levels in their discipline, to give them a resource for the latest information on numerous topics. Do you know the difference in conformation between a successful dressage horse and a hunter, or jumper or eventer? Those differences are explained in this book, to help you refine your knowledge before you go horse-shopping. Those differences are what distinguish a nice, ordinary horse with some talent from a horse with the capability of spectacular showing ability. With a forward by Dr. Gerd Heuschmann (Author of "Tug of War" and numerous other books and DVDs), this essential guide to horse-shopping and horse care is being published by Xenophon Press in 2019. When I have more information and cover art, I'll share it here. Sculpting 101: A Primer for the Self-taught Artist, Second Edition. "If you've always wanted to play in clay but didn't know how, this is the book for you! Internationally collected and award-winning sculptor Lynda Sappington shares her knowledge in simple, clear language and numerous pictures how to work in water-based clay, polymer clay and professional plastilene. 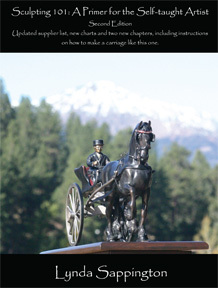 New in this second edition of "Sculpting 101" is a chapter on how to make a carriage and one on shipping both raw clay pieces to the foundry and finished castings to customers. The entire book has been revised and updated, including a revised and expanded suppliers' list and a new horse measurement chart. Other subjects covered include: armatures (for both animal and figurative sculptures as well as busts); how to make and cast reliefs; how to measure horses and other subjects for portraits; how to make a one-piece mold; how to cast in paper, resin and bronze; style and design; editions and certificates of authenticity; foundries and how to talk to them. Two of the four appendices show in pictures and words two different methods of casting bronze. "For those embarking on the adventure of sculpture, this text will help guide them through the many stages. Lynda presents the information in a clear, straightforward way, making the information accessible even to the novice sculptor." New in the second edition: A chapter on carriage-building; a chapter on shipping raw clay sculptures to distant foundries; lots of other new information. Completely revised and updated. See the Table of Contents and a sample chapter here. 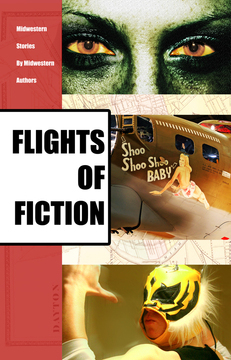 "Flights of Fiction" is an anthology of short stories set in the Miami Valley, Ohio. This book includes a short story of mine, "Lisa Goodman, Writer" which is a real departure for me - no magic, no fantasy, a real suspense/horror story You can order it from me or on Amazon for $11.95, but if you order it from me, I'll be happy to autograph it for you (shipping charges should be around $5 extra). We never sell or share our mailing list. Your privacy is important to us. If you have problems with this site, please contact the Webmistress.